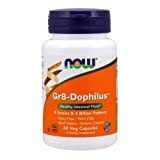 Gr8-dophilus is a probiotic supplement manufactured by NOW Foods. This probiotic combination is promoted to support gastrointestinal health and immune system function. Gr8-dophilus contains a non-dairy based combination of 8 different probiotic strains, Lactobacillus acidophilus, Lactobacillus casei, Lactobacillus rhamnosus, Lactobacillus salivarius, Streptococcus thermophilus, Bifidobacterium bifidum, Bifidobacterium longum and Bifidobacterium lactis. In addition to probiotic bacteria, this supplement also contains a prebiotic fiber, known as FOS (fructooligosaccharide). Prebiotics are indigestible carbohydrates that stimulate the growth of probiotic organisms. NOW Gr8-dophilus is formulated in an enteric coated capsule, designed to be resistant to stomach acids. This means that its probiotics are protected from the harsh conditions of the stomach and are viable to reach the gut. Gr8-dophilus is positively reviewed online, with customers citing benefits for digestive function. It is presently ranked #42 out of the best-selling Acidophilus probiotic supplements on Amazon. Most of the online reviews of the Gr8-dophilus product have been positive for treating IBS (Irritable Bowel Syndrome) and for improving the immune system, especially for people who travel and get frequent respiratory illnesses. Positive results are also reported for those with Crohn’s disease and chronic Candida infections. People who have allergies to dairy and egg products have reported good results with this product. There are also positive reviews for individuals with Celiac disease and on-going gastrointestinal tract issues. Each serving of NOW Gr8-dophilus provides between 11 billion to 4 billion live probiotic organisms per dosage. This dosage does meet the recommended guidelines set out by health experts based on results from clinical trials. The eight different probiotic strains that are found in Gr8-dophilus have been researched for a wide range of health-boosting applications. By combining multiple strains of Lactobacillus and Bifidobacterium probiotics together, this supplement may provide more benefits compared to single-strain probiotic products. Probiotics work generally by colonizing the gastrointestinal tract and limiting the spread of harmful disease-causing bacteria. The probiotic bacteria strains found in this product include 8 different types of Lactic Acid Bacteria. These living organisms break down foods that we consume and convert them into lactic acid. As a result, a low pH balance is maintained in the gut. This environment is hostile to harmful bacteria and makes it difficult for them to gain a foothold. Probiotics can also help to support immune function and may stimulate the release of antibodies, which fight infections. They also help to ensure that the lining of the intestinal wall is functioning properly to keep bad bacteria out of the body. The probiotic strains used in Gr8-dophilus are also being looked at for their general health benefits, which may include improved cholesterol management, better mood, better blood sugar control and protection from the common cold and flu symptoms. The probiotic strains found in Gr8-dophilus include four strains of Lactobacilli bacteria. These are: Lactobacillus acidophilus, Lactobacillus casei, Lactobacillus rhamnosus, Lactobacillus salivarius. These bacteria tend to colonize the upper gastrointestinal tract and are also found naturally in milk and yogurt products. Lactobacillus probiotics are considered effective for reliving diarrhea, atopic dermatitis (eczema), bacterial vaginosis, irritable bowel syndrome, respiratory tract infections and a number of different digestive conditions. Gr8-dophilus also contains three strains of Bifidobacterium probiotics. These probiotics tend to colonize the lower gastrointestinal tract and are found in very high numbers in breast milk and in the digestive systems of infants. These bacteria include Bifidobacterium bifidum, Bifidobacterium longum and Bifidobacterium lactis. These species are considered possibly effective for constipation, preventing certain infections, diarrhea, ulcerative colitis, IBS, pouchitis and more. The final strain in NOW Gr8-dophilus is Streptococcus thermophilus. This is another species of lactic acid bacteria that is used in the production of yogurt, milk and cheese. Like the above-mentioned strains, it helps to prevent against the growth of pathogenic bacteria and can be used to restore normal balance to the gut microflora. Combining these strains together is considered to have more beneficial effects than if you were to take one strain on its own. Each of these probiotics work in their own way to contribute to a healthy intestinal microflora. A clinical study published in the Journal of Gastroenterology and Hepatology in January 2014 showed the multispecies probiotics are effective in treating the symptoms of IBS patients and changing the composition of intestinal microbiota. The patients were given a mixture of Bifidobacterium longum, B. bifidum, B. lactis, Lactobacillus acidophilus, L. rhamnosus, and Streptococcus thermophilus twice a day or the placebo for 4 weeks. The proportion of patients whose IBS symptoms were significantly relieved at week 4 was notably higher in the probiotics group than in the placebo group: 68.0% (17/25) versus 37.5% (9/24). A clinical study published in PLos One in February 2016 showed there was a reduced level of bifidobacteria in patients with long-term asthma. The clinical study suggested that therapeutic modulation of the gut microbiota in this group of patients might be beneficial. A clinical study published in the Journal of the Science of Food and Agriculture in October 2015 showed the potential use of probiotics intervention in reducing the allergic response to whey proteins in mice. The mice were given probiotic Dahi with Lactococcus lactis ssp. cremoris NCDC-86 and Lactococcus lactis ssp. lactis biovar diacetylactis NCDC- 60 along with selected strain of Lactobacillus acidophilus LaVK2 and Bifidobacterium bifidum BbVK3. The study concluded feeding with probiotic Dahi suppressed the elevation of whey proteins-specific IgE (Immunoglobulin E) and IgG (Immunoglobulin G) response of WP-sensitized mice. IgE is associated with type I hypersensitivity found in allergic diseases. These diseases include allergic asthma, allergic rhinitis, most types of sinusitis, as well as food allergies, and some types of chronic urticaria (hives) and atopic dermatitis (inflammation of the skin). IgG is an antibody found in blood that prevents the body from infection. A clinical study published in the Journal of Clinical and Diagnostic Research showed Lactobacillus acidophilus and Bifidobacterium bifidum can help to maintain healthy cholesterol levels. Hypercholesterolemic patients given this combination probiotic saw decreased serum total cholesterol, LDL-cholesterol and HDL-cholesterol levels in patients over a six-week period. This could suggest a role for probiotics in preventing heart disease and related conditions. Some reviews of the Gr8-dophilus product have reported intolerance to the FOS ingredient, causing diarrhea and intestinal gas. Others have reported problems with constipation. Most side effects from taking NOW Gr8-dophilus and other probiotic supplements are mild and transient. These species are considered safe when used appropriately and all of the bacterium found in this supplement are naturally found in the human gut. According to the manufacturer, this product is suitable for children above four years of age and adults. However, it is recommended to check with a doctor before giving probiotics or any supplement to a child. Probiotics should not be taken by immune impaired individuals, those with open surgical wounds or those using a catheter. People with SBS (Short Bowel Syndrome) should avoid Gr8-dophilus due to a risk of bacterial translocation. Unless otherwise directed by a medical professional, Gr8-dophilus probiotic supplements should not be taken during pregnancy or whilst breastfeeding. Also, probiotics will interact with antibiotics. They should be used at least two hours apart from each other. This probiotic product is non-dairy and may be suitable for lactose intolerant individuals. It is also suitable for both vegans and vegetarians. Gr8-dophilus is suitable for treating constipation and for boosting the immune system. Yoon JS, Effect of multispecies probiotics on irritable bowel syndrome: a randomized, double-blind, placebo-controlled trial. J Gastroenterol Hepatol 2014 Jan;29(1):52-9. doi: 10.1111/jgh.12322. Altieri C, Modelling the survival of starter lactic acid bacteria and Bifidobacterium bifidum in single and simultaneous cultures. Food Microbiol 2008 Aug;25(5):729-34. doi: 10.1016/j.fm.2008.03.005. Epub 2008 Apr 1. Rerksuppaphol S, A Randomized Double-blind Controlled Trial of Lactobacillus acidophilus Plus Bifidobacterium bifidum versus Placebo in Patients with Hypercholesterolemia. J Clin Diagn Res 2015 Mar;9(3):KC01-4. doi: 10.7860/JCDR/2015/11867.5728. Epub 2015 Mar 1. Hevia A, Allergic Patients with Long-Term Asthma Display Low Levels of Bifidobacterium adolescentis. PLos One 2016 Feb 3;11(2):e0147809. doi: 10.1371/journal.pone.0147809. eCollection 2016.